Paraiso focusses on carnival. 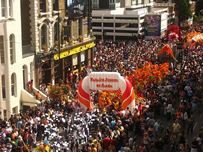 Most of our activities throughout the year - samba dance classes and percussion workshops, events, costume making and carnival arts workshops, and educational projects - are related to preparing for the best possible parade at Notting Hill. Although dance and percussion form a big part of what we do, there are lots of other activities - float design & construction, sound systems, helping with organisation...and just socialising. If you are interested in participating please contact us or just come along to one of our events. Every year we have a new theme which covers our activities and carnival parade. A theme song (Samba Enredo) is written each year which is played and sung throughout the carnival. We follow the tradition of Rio Carnival - we incorporate all the main elements of a Rio Carnival parade in the Sambadrome. Ours is a little smaller - we parade with a total of 250 in costume whereas in Rio samba schools in the Grupo Especial parade with up to 4,000!